Protesters rally after a march for Freddie Gray that ended in front of the Baltimore Police Department’s Western District police station April 21, 2015, in Baltimore. Gray, 25, died from spinal injuries April 19, one week after being taken into police custody. 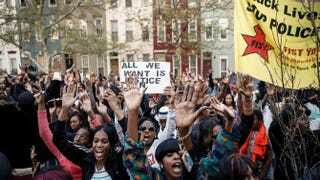 The streets of Baltimore were flooded with residents Tuesday protesting the police force in the name of Freddie Gray, the young man who died from a severe spinal injury while in police custody, the Daily Mail reports. Also Tuesday, the Justice Department announced its own civil rights investigation into Gray’s death as police officials released the names of the six officers who were involved in Gray’s arrest and transport. According to the Daily Mail, protesters gathered around the site of Gray’s ultimately fatal arrest before marching to the police station, chanting and holding up the now all-too-familiar signs reading “Black Lives Matter” and “No Justice, No Peace” that have come to define the movement against police brutality. The six officers involved—Lt. Brian Rice, Sgt. Alicia White, and officers Ceasar Goodson, William Porter, Edward Nero and Garret Miller—were all reportedly suspended with pay. At least one person was detained as protesters jumped past police barriers that were meant to control the crowd. Gray reportedly requested an inhaler before asking several times for medical care. He was eventually taken to the hospital by ambulance but died about a week after his arrest from a “significant spinal injury,” as Deputy Police Commissioner Jerry Rodriguez described it. It is still unclear how Gray was injured and what happened during his trip in the van, which lasted roughly half an hour. Gray’s family lawyer said that the police had no reason to stop the young man.